Luxury packaging designer and global distributor Keenpac, is the proud winner of Disney’s prestigious environmental award; “Most Sustainable Vendor, Europe 2011”. 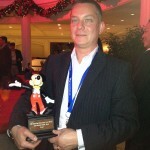 The award was presented at this year’s Annual Vendor Partner Meeting held Thursday 17th November at Epcot Studios, Florida. It is the annual showcase event, in which around 200 delegates from Disney’s suppliers around the world, come together to share Disney’s plans for the following year. The awards presentation is Disney’s way of giving special recognition to its top suppliers. Last year Keenpac was one of four companies to have been nominated for the award, giving recognition to its work on the Disney packaging range which is both sustainable and environmentally friendly. This year, it was an outright win! Having worked with Disney for the last 6 years, Keenpac supplies a complete range of colourful Disney gift boxes and themed shoppers to Disney’s stores across Europe. The inks chosen for the boxes are natural soy, finished with a high gloss, yet environmentally friendly aqueous varnish. The end result – a 90% recycled box which is 100% recyclable. Following the same eco-brief, Keenpac supplies a wide range of colourful shoppers each themed to Disney’s very latest film and DVD releases – The Lion King, Disney Princess, Alice in Wonderland, Cars and the very latest of course, The Muppets. Not surprisingly they’ve become a real hit with Disney fans, and because they’re made from recycled PET, produced from recycled plastic bottles, they’re kind to the environment too! The Award was presented to Jim Maddison of Keenpac by Teresa Tideman, MD, The Disney Store Europe, and of course Mickey and Minnie Mouse! !